Fourth graders in traditional public schools are doing better in both reading and math than students in charter schools, the government says in a report fueling fresh debate over school choice. Charter schools are public schools that are sometimes run by private entities and are usually free of many of the regulations that govern traditional public schools. 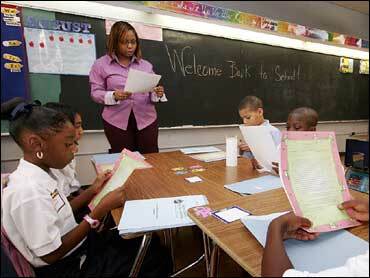 They have become popular in many areas where traditional public schools are struggling. Tuesday's report said fourth graders in regular public schools scored an average of 5.2 points better in reading than students in charter schools on the 2003 National Assessment of Educational Progress test. Students in traditional schools scored an average of 5.8 points better in math. Charter school opponents say the findings show that the schools are a failing experiment that drains resources from traditional public schools. Charter school supporters call the report flawed and outdated and argue that charters - which have the support of the Bush administration - improve public education by creating competition. Mark Kenen, head of the Massachusetts Charter School Association, in an interview with CBS News correspondent Dan Raviv, says that instead of comparing charter school students to those in all public schools, the comparison should be to performance in the schools the charter school students came from – which are some of the nation's most troubled schools. "We serve a much more challenged population - by design - than an average population," he explains. "So it's no surprise that at the fourth grade, our scores are going to be lower." Kenen adds that studies of charter school students do show an improvement in performance compared to the schools they formerly attended. Nelson Smith, president of the National Alliance for Public Charter Schools, said the report is flawed because it does not measure academic progress over time. He said many students enter charter schools after struggling in traditional schools, only to improve their test scores over time. He also noted that many charter schools in the study had been operating only a short time. "It takes charters a year or two to get their sea legs, and then their performance goes up," Smith said. The head of the government agency that produced the report cautions against reading too much into it. "This was a pilot study and not meant to be definitive," said Mark Schneider, commissioner of the National Center for Education Statistics, which did the report for the Department of Education. "What does this report say to a parent? Not much, frankly," Schneider said. Still, he said the report provides solid data for researchers to do more studies. "My advice to parents based on this report is: Shop around carefully," he said. The report offered some good news about charter schools: Reading scores at charter schools in central cities serving mostly minority students were comparable to scores at traditional public schools. However, math scores at such charter schools still lagged behind those at traditional schools. "On average, they're not doing harm," Schneider said of charter schools. The NCES studied fourth-grade math and reading scores at 150 charter schools and 6,764 traditional public schools nationwide. At the time, there were nearly 2,700 charter schools in 36 states. There are now more than 3,600. The test scores were from the 2003 NAEP, an assessment given to students across the country. The American Federation of Teachers said the report confirms its research showing that charter schools are not improving education in America. "It says that they were not able to deliver on their promises on a consistent basis," said Nancy Van Meter, deputy director of the teachers union. The Center for Education Reform, which supports charter schools, issued a list of studies showing that charter school students in several states outperform students in traditional public schools.